When people ask us what kind of flowering tree they should plant in their yard, Matt has lots of nuanced answers. I almost always say: a serviceberry. White flowers in the spring, tasty fruits for you and the birds in June, fall foliage, and often a nice multi-stemmed growing habit...what's not to love? But whether you have a yard or not, now is the time to look for the berries. They're smaller than a typical cultivated blueberry, but they have the same sepals on the bottom. As they ripen, they turn from magenta to a dark purple. 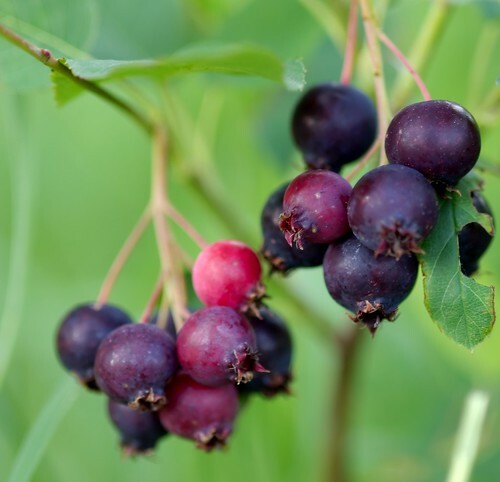 Serviceberries were widely used as a food by Native Americans, and George Washington planted several at Mount Vernon. But they don't ship well, so they've never taken off as a commercial fruit. Serviceberries go by many names, and each name has a story. The story I have heard related to the "service" is that they bloom around the time the ground thaws in the spring, and so were associated with the funeral services that happened when graves could first be dug (other authors say it's a corruption of "sarvisberry," a reference to the European mountain ash). Around the same time of year, shad (a type of saltwater fish) come up rivers to spawn, and so serviceberry is also known as shadbush. The name we first learned for serviceberry was Juneberry; this may be more or less accurate depending on your latitude and elevation. Then there's the Latin genus name: Amelanchier, which comes from the French amelanche, an old word for a small apple. 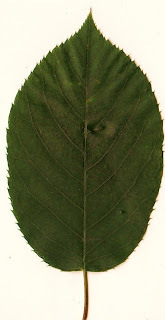 There are several species within the genus; native to this area are canadensis, laevis, and arborea. But, William Cullina writes, "They freely interbreed where ranges overlap, creating a vast and notorious hybrid swarm that has driven sober botanists to drink. You really never know for sure what you are going to get." We're usually just happy to know we're looking at an Amelanchier. In the wild: Serviceberries are scattered through the woods here; they're an understory tree that's rarely more than 2o feet tall, but can reach 40 feet. It may be easier to find some of the ornamental plantings we're aware of: to start with, a few at the corner of Carroll and Laurel in Takoma Park; several large trees at the Lowell School on the edge of Rock Creek Park; and several in the 1600 block of Corcoran St. NW in DC. The densest population of serviceberries we have ever seen is in the Dolly Sods area of Monongahela National Forest, but they won't be ripe there until July or August. In your yard: Yes, please. Local nurseries carry them in stock. Different species and cultivars have different characteristics (e.g., single stem vs. multi-stem), so be sure you know what you're getting if you have a preference. In general, serviceberries will flower and set fruit better with some sun, but they can also take shade. Where else have you found serviceberries? Leave a comment if you're willing to give away your spot!